At 30% protein content, Soaring Free Superfoods? Hemp Protein Powder is the perfect complete plant protein source for vegans and vegetarians. Hemp Protein Powder is an easily digestible complete protein for building and repairing tissue. It even boosts your immune system and contributes towards digestive and colon health! This ancient food can be traced back thousands of years across multiple cultures, where it was revered as complete food source. Hemp powder is made from the pressing and hulling of hemp seeds. 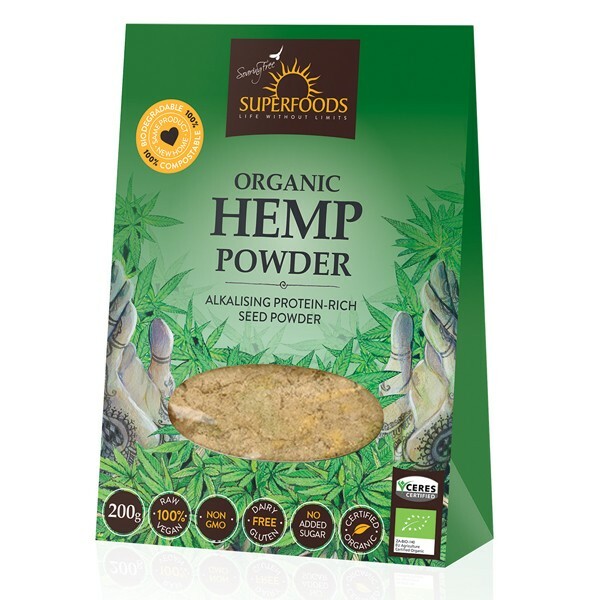 Hemp powder contains all the essential amino acids and is high in fibre. At 30% protein content, Soaring Free Superfoods? hemp powder is the perfect complete plant protein source for vegans and vegetarians. Hemp Protein Powder has a great nutty flavour. Mix it into your favourite smoothies, snack bars, soups or other savoury options. Our favourite way of using it is too combine it with hemp seeds, seaweed powders and salt as a salad sprinkle to upgrade your daily nutrition. Best taken just following intensive exercise. Recommended 15 ? 50g daily.